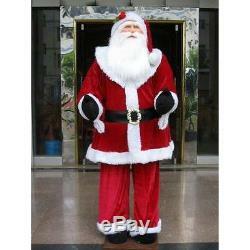 Vickerman Huge Life-Size Decorative Plush Santa Claus (Sitting or Standing), New. Message us for return instructions. We are unable to accept any items that have been used as well as any food items. If you miss Santa coming down the mney to enjoy some warm milk and cookies. This life size Santa will make you feel like he is part of the family! 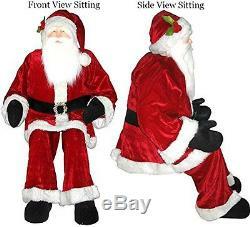 Plush parts connect with PVC poles to make Santa stand up or sit down. Santa's feet are connected to a 16" x 16" display platform. This is a display figure. It is not intended to be used as a toy. We will work with you to resolve any problem you may have. We reserve the right to cancel any order for any reason at any time. We are not responsible for undeliverable addresses. All of our items, unless otherwise stated, will only run on 120 volts. Please check to make sure your country complies with these specifications. The item "Vickerman Huge Life-Size Decorative Plush Santa Claus (Sitting or Standing), New" is in sale since Wednesday, December 21, 2016. This item is in the category "Collectibles\Holiday & Seasonal\Christmas\ Current (1991-Now)\Other Current Christmas Décor". The seller is "fanteller" and is located in US. This item can be shipped to United States.